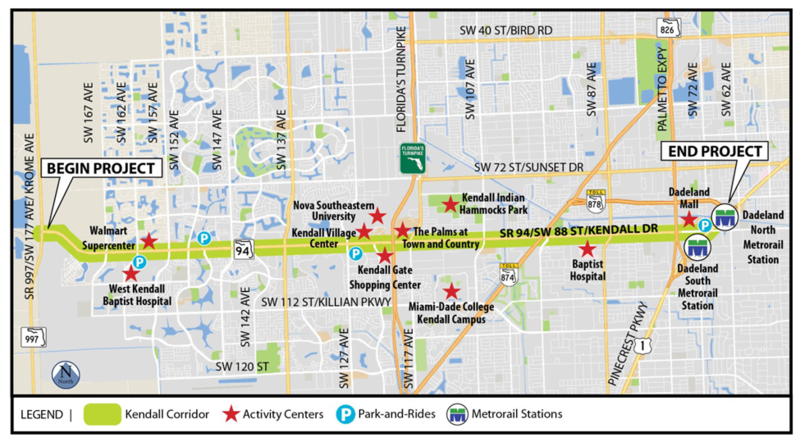 The Florida Department of Transportation (FDOT) is studying the implementation of rapid transit along State Road (SR) 94/Kendall Drive/SW 88 Street from SR 997/Krome Avenue/SW 177 Avenue to the Dadeland North Metrorail Station. Refer to the project map below. This corridor is part of the Strategic Miami Area Rapid Transit, or SMART Plan, which identifies the development of six rapid transit corridors that directly support the mobility of our future population and employment growth. The five other SMART Plan rapid transit corridors include the Beach Corridor, East-West Corridor, North Corridor, Northeast Corridor, and South Dade Transitway. Study activities will be performed in the context of the Kendall Drive corridor, while coordinating with the overall multi-corridor Smart Plan. This Study is focusing on improving Kendall Drive through the implementation of a cost-effective, high-ridership, new premium transit service with supporting pedestrian and bicycle facilities. Premium transit modes to be evaluated include Bus Rapid Transit (BRT), Light Rail Transit (LRT), Heavy Rail Transit (HRT), and Metrorail at-grade (powered by overhead lines), on exclusive lanes. A comprehensive public involvement program is being conducted as part of this study. The program consists of formal and informal meetings with the general public, government agencies, elected officials, municipal staff, local transportation providers, and other interested parties. As a member of the community, your involvement is vital. The environmental review, consultation, and other actions required by applicable federal environmental laws for this project are being, or have been, carried-out by FDOT pursuant to 23 U.S.C. § 327 and a Memorandum of Understanding dated December 14, 2016, and executed by FHWA and FDOT.